My previous post concentrated on the Green Deal, the need to retrofit the UK building stock and the challenges that this new scheme and the retrofit sector face. The focus was on the energy performance gap and the hidden costs, which are among the main obstacles preventing the owners and occupants of dwellings from taking up energy efficient improvements under the Green Deal. At the moment, local authorities are leading the way on the Green Deal, making an effort to convince their residents on the benefits that energy efficiency improvements can bring through cosier, warmer homes and, most importantly, lower fuel bills. DECC is working closely with councils to support their work on the Green Deal. However, individual owners appear more reluctant to take up the new scheme at the moment. This article will focus on the barriers responsible for this attitude and will analyse different categories of people, based on their behaviour towards energy efficiency and retrofit. Finally, it will identify messages and channels of communication for these categories. Energy efficient retrofit had been a concern for a number of years prior to the introduction and beginning of the Green Deal implementation. Therefore, the reasons holding back energy efficient improvements in the domestic UK sector have been investigated by various researchers in the past. Barriers to domestic retrofit, as identified in the UK, include the capital cost of investment, the hassle of refurbishment, uncertainties over lower fuel bills and the lack of knowledge over payback periods. Other researchers focus more on the social aspect of barriers, identifying cost, the property itself and personal behaviours, beliefs and information as the main reasons hindering energy efficient improvements in the UK domestic sector. Personal behaviour is a very complex social barrier, which can be divided into the following sub-barriers: laziness, lack of time, convenience and forgetfulness. Keeping up with appearances and the desire for more gadgets are also important personal concerns. Although gadgets are becoming more energy efficient and energy ratings are used in order to certify their level of efficiency, because of the increasing number of gadgets, per user improvements in efficiency do not necessarily contribute to an energy consumption reduction overall. 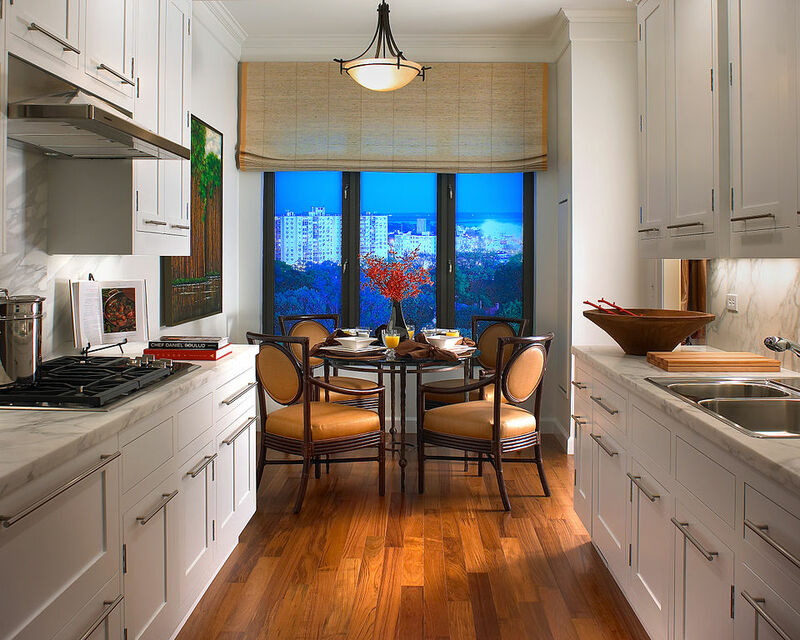 Moreover, it looks like the energy efficient improvement of homes is typically not considered as important as other non-energy related changes to dwellings, such as general repairs, which are viewed as socially more significant. For example, people seem to prefer amenities such as new kitchens, bathrooms and central heating, instead of energy efficient refurbishments, such as loft insulation since the social gains are more obvious. Due to the complexity of domestic retrofit and the barriers hindering it, DECC commissioned research before the scheme’s introduction. The purpose of this research was to understand the key groups in relation to potential demand for the Green Deal, their attitudes to home and the environment, their motivations and barriers, their demographic, geographic and situational characteristics and, finally, the communications channels best for reaching them. The survey was conducted through interviews with 2,050 owners-occupiers and private rented tenants in Britain and its results were published in a report in November 2012. 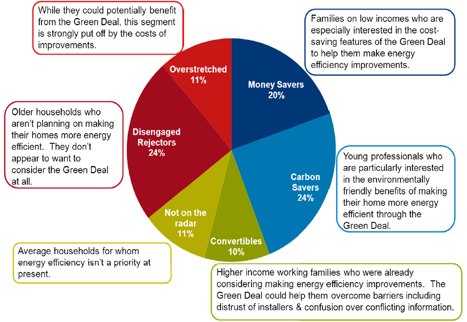 The report identified six segments of people listed in order of how likely, according to their survey responses, they were to take up the Green Deal package: Money Savers, Carbon Savers, Convertibles, Not on the Radar, Disengaged Rejectors and Overstretched. These six segments are presented and briefly described in the figure below. According to the report, each one of these segments has a higher or lower interest towards saving money or energy. Money Savers and Carbon Savers, as their names reveal, are the people attracted by the cost savings and the environmental benefits of the retrofit, respectively. Convertibles are higher-income working families, hindered by non-financial reasons from taking up energy efficiency improvements and who can potentially benefit from the Green Deal. They recognise the benefits of having more energy efficient homes. However, they are held back by a general lack of time or lack of trust towards the installers. The last three categories are less or not likely at all to consider the Green Deal either due to costs, an unwillingness to make changes or because energy efficiency is not a priority. The incomes of these three categories are lower than average according to the report. There are more people in these categories with low income (less than £17K) compared to the other groups identified in the research. Moreover, these groups include significant numbers of people who don’t work, with a percentage that reaches 53% in the case of the Disengaged Rejectors. Within these six segments, Money Savers and Carbon Savers make up 20% and 24%, respectively, of owner occupied/private rented tenant households that need at least one energy efficient home improvement. An equally large percentage — 24% — belongs to the Disengaged Rejectors, who are not planning on making any energy efficiency improvements on their homes and are not at all interested in the Green Deal. The results of the research identify which messages are important to the different segments. For example, having a warmer or more comfortable home, saving money and reassurances and warranties, are messages that have been identified as the most successful ones among all segments of this research. 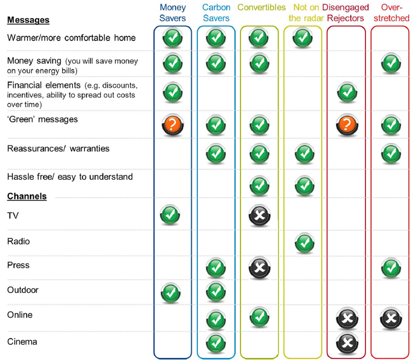 While other financial incentives and discounts apply more to the Money Savers and the Disengaged Rejectors, “green” messages are important to the Carbon Savers, the Convertibles and the Overstretched and finally hassle-free ways to make energy efficient home improvements are important to the Convertibles and the Not on the Radar segments. What is also very important is that communication channels for these segments have been identified and can be used to target different people for each one of the categories identified. “Warmer and more comfortable homes” together with “money saving” are the right messages to attract Money Savers, Carbon Savers and Convertibles, while “money saving” can even attract the Overstretched ones. The Convertibles are the easiest to approach, also through “green messages”, “reassurances and warranties” as well “hassle free and easy to understand” solutions. The most difficult category to deal with is that of the Disengaged Rejectors who could only be interested in “financial elements”, such as discounts, incentives and the ability to spread out costs over time. In terms of media channels, TV and outdoor advertising would be effective in communicating with both Money Savers and Carbon Savers. Disengaged Rejectors also watch a similar amount of television. Radio would only really be effective for reaching the Not on the Radar segment as they are the heaviest radio users, while they don’t watch TV. Carbon Savers, Not on the Radar and Overstretched segments could be reached through the press. Finally, Convertibles and Carbon Savers are more likely than average to be heavy users of the internet, making this the most important communication channel for this segment. Both the messages that can attract different segments of people, as well as the channels through which they can be approached, are presented in the figure below. It is very important to identify the influence of the consumers’ attitudes on energy efficiency in the UK domestic sector. 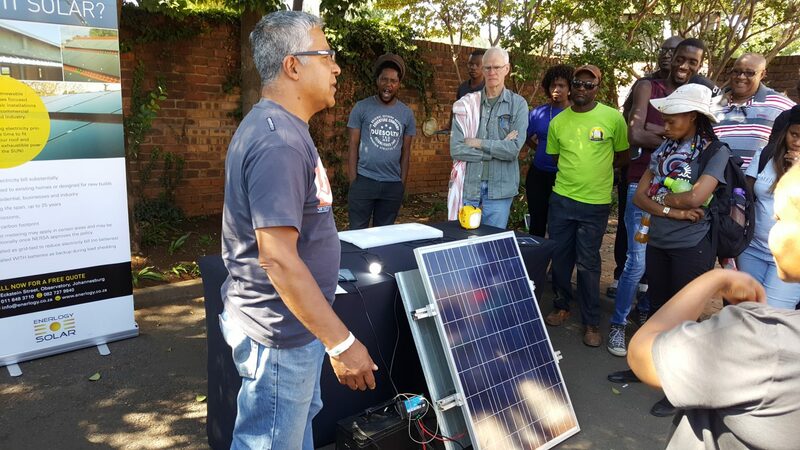 Moreover, their connection to specific segments of the society can be vital for energy retrofit improvements. Finally, if wisely used by the Green Deal providers and assessors, as well as by the government, the identification of different communication channels for each one of the Green Deal segments, can contribute significantly to the successful promotion of the new scheme.